No lugs means no overtones – just perfect tension, tuning and tone. The patented Sleishman suspension system truly brings drum shells to life and it completely separates our drums from any others available today. Take an empty drinking glass, tap it and listen to its sustain. Then, lightly hold the glass and tap it again…a very different sound. You’ve killed the natural sustain of the glass. This simple exercise actually demonstrates the physical impact lugs and bolted fittings have on any given drum shell. Without the restrictions placed on it by sometimes more than twenty bolted fittings, the drum shell can now resonate to it’s full potential. 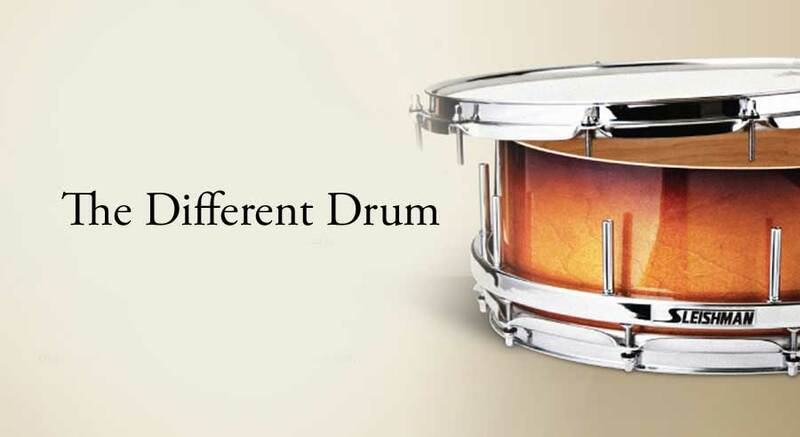 Obviously, this is going to give you much more sustain in note length, increased volume levels (which in turn gives you more control over the instrument), and another benefit of our system is a massive amount of tone.In short, Sleishman Drums work at a far greater efficiency level than any other drum on the market. The all-new Sleishman Pro Series is a result of 35 years in research and development into making one thing possible: providing drummers with the best sounding & best value professional drums available anywhere in the world today. Utilising the Sleishman patented free-floating tuning system, no other drum comes close in both tone and tune-ability. They truly sound ‘Pre Eq’d’ and are just far too easy to work with in any musical situation, room or volume. For more information click the Learn More button. With our patented pedal design, balance is now finally achieved… Its logical set up puts you into the center of your drum kit. The Sleishman Twin Pedal is the only one on the market that has exactly the same action for both left and right, without incorporating any bulky extension arms or universal joints. The Sleishman Drum Company is an Australian-based business, founded in 1971 by Don Sleishman – inventor and drum manufacturing pioneer. Sleishman invented and developed the World’s first ‘Twin Pedal’ for drummers. The pedal was patented, produced commercially and marketed. Sold worldwide with the help of UK based investment, the product established the Sleishman brand as unique and innovative. The very first Sleishman free floating drum tuning system was invented and applied to the acoustic drum set. Patent for the drum tuning system was first granted. Sleishman moved to a larger factory premises. Along with continued business growth, Sleishman began work on developing a simpler tuning system for the drums. This improved system proved to be a substantial leap forward in sound of the drums the company was producing. Michael Turner meets Don Sleishman while on tour in Sydney. Michael and Don connect on many levels regarding drum design and development. Michael purchases his first Sleishman drum set and takes it back to the state of Queensland and begins representing the brand. The decision was made to take out new patents on this improved system. The system was further developed and patent was granted. The same year, thanks to a UK distributor, Roger Taylor (drummer/song writer with the band Queen) was introduced to Sleishman drums and purchased a set instantly. Sleishman decided to re develop its original invention – The Twin Pedal. Will Calhoun of the US based band ‘Living Colour’ becomes a Sleishman Twin Pedal artist. Sleishman applies new patents to the re developed Twin Pedal. New Twin pedal Patent Granted and work begins on new production model. David Sleishman, son of Don Sleishman takes over running the day to day operations of the Sleishman drum company. New production run of the Twin Pedal completed. Sleishman shows at the NAMM trade show in Anaheim for the first time in 10 years. US dealers take on the Sleishman pedal in increased quantities. Sleishman begin to sell custom drums on mainland USA after a second consecutive NAMM show. Sleishman Europe is formed and product is sold via distribution in The Netherlands. Sleishman begins planning for a new US distribution model with Michael Turner and Lee Griffin. Sleishman begins production on new ‘Pro Series’. New agreement for USA distribution is signed with long term associate Michael Turner and new Sleishdrum, LLC is formed. Sleishdrum Pty Ltd Australia has sold over 30 Pro Series kits in Australia within 4 months of the launch of the product into the market.